being hero in their own movie. The session is scenario-based, as we enact together as a creative ensemble to shape, form and embody the Verbal, Vocal & Visual qualities of our most revered mentors and role models. Renewed confidence and a greater ability to make a difference in their lives, as well as increase impact and effectiveness of their contribution to humanity – through learning tangible tools to put immediately into practice and bring their voice, message and story out into the world as they’ve always dreamed possible. A perfect fit. I will expand upon the popular presentations I have given to the last two Story Conferences, this time taking the focus on enhancing live presentation skills to a new level – to enhance people’s capacity to re-write the stories they have been telling themselves and step up to make a greater contribution with their family, their community, their company, their country, and our world at large – which desperately needs new leaders and people stepping up to make a difference in the quality of life on this planet. 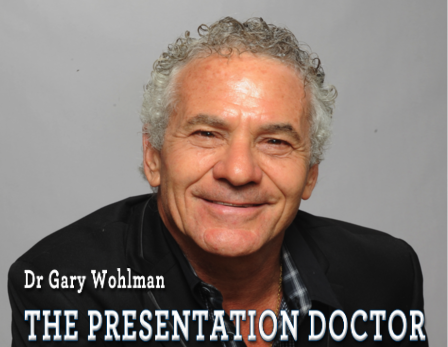 Dr. Gary Wohlman is an innovative presentation coach who trains CEOs, managing directors, senior managers and executive committees of leading organisations, as well as professional speakers and entrepreneurs in a wide range of industries. His streamlined approach to facilitating communication breakthroughs combines 45 years of performance-based leadership training, team-building and platform skills. Dr. Wohlman holds a B.A. degree integrating Psychology & Pre-Med from Johns Hopkins University, and a Ph.D. in Transpersonal Psychology & Expressive Arts from the International University of Professional Studies. His proprietary method of body therapy, the “Wohlman Method for the Whole Person,” has received government accreditation by the Department of Education & Training in Australia. 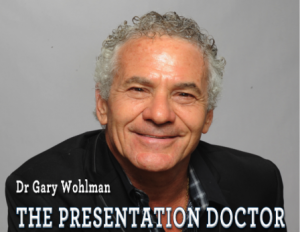 His vast experience in numerous disciplines makes it possible for Dr Gary to reach people on multiple levels and senses simultaneously ~ awakening people’s abilities to communicate with optimal vitality, engagement and audience participation. Through this refreshing approach, clients reach deeper connection with themselves and their messages and enhanced rapport with their audiences through the relationship-building skills Dr Gary demonstrates. His tremendously fun, finely-tuned interactive style and extraordinary ability to create a safe supportive atmosphere inspires participants to awaken authenticity and take action in their lives as never before.